1. Best build in its class. There are a plenty of good machines out there, and believe me when I say this, that the new MacBook Pro beats them all, hands down. The love for detail that has gone in making this machine is absolutely fantastic. You won't find anything that looks misplaced or out-right in any of the machinery. 2. 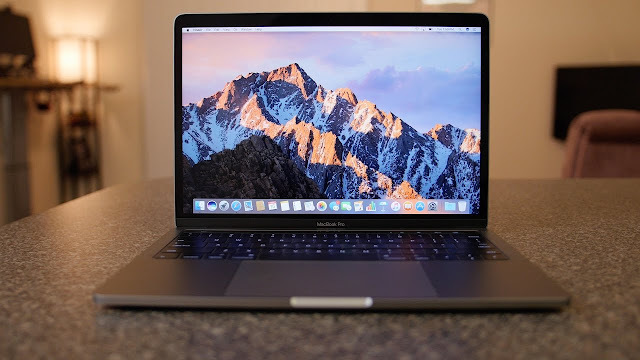 The screen, and man oh man is it great, I have used a lot of windows laptops and till date haven't come across a screen as gorgeous as the new MacBook Pro. 3. The keyboard, and this maybe subjective, as for me I feel the new keyboards is a breeze to type on, the large and shallow keys are easy to reach and the backlighting makes typing in the dark a joy to behold. 4. Mac OS, The main purpose for many to get a Apple PC apart from it being an Apple, is the Operating System. Mac OS is so fluent and good looking, that looking back at my old Windows PC makes me cry. The Metro style interface is good, but it still doesn't have that vibe that Mac OS does. plus the level of performance that a Mac machine gives, that too at this price bracket, is comparable to most higher spec'ed Windows PCs as well. 5. The trackpad. Best in its class. Believe me after using this trackpad, its very hard to go back to any other trackpad, although windows have updated their trackpad with new windows precision drivers. The MacBook Pro trackpad are a joy to move your fingers around. The palm rejection and gesture controls are really great. Plus with no mechanical buttons to click on, the force touch trackpad registers your finger no matter where you click on it. 6. Portability, This might not be the most portable machine to have. But the MacBook Pro is the most lightweight, easy to move around machine you can buy. The weight is perfectly balanced. So you don't the need to adjust the laptop to your liking rather than the other way around. 1. Limited I/O, although I didn't face any issues with my current working scenario, others might. The laptop comes with either 2 or 4 USB type c ports depending on the model you're purchasing. This might be limiting to some. But for others I don't think it will be much of an issue. 2. The Price. Many are aware that Apple products are a bit or too pricey to be exact. It should come to no surprise that the new MacBook Pros follow the same. With the base model coming at around a 1 lakh INR. But you get the performance that you'd expect that the price comes with. It's not like that windows laptops are not pricey, in-fact windows laptops range from a lot of different prices, starting from a few thousands to all the way upto 10 lakhs or so. So it basically depends upon you and you're liking. 3. Upgrades, and this might be a shocker. But the new MacBook Pro's are non upgradable, thats right, the configuration which you get is the configuration you have to remain with, for as long as you use the machine. This might be a bummer to some. But in reality it's not that of an issue as you might think, you have to understand the fact that both the hardware as well as the software are made by Apple and Apple only. So It's very well optimised for the system. With my limited use of the machine. I have faced no lag or slowdowns whatsoever. But the OS itself is quite intuitive. It feels nice. So what are my final verdicts regarding the new MacBook Pro 2017. Well for starters its the most gorgeous looking piece of hardware you will ever use. Its fast, responsive, fun and a lot intuitive. There are a few drawbacks here and there, but I think the pros outweigh the cons. I hope this review was useful to you. P.S. : If you have any doubts regarding the new 2017 MacBook Pro, do let us know with a comment and we will be happy to help you. All the things that have been mentioned above are from personal experience and are not doctored in anyway. I will be providing a more comprehensive review after using the machine for a month or two so stay tuned and subscribe to www.youtube.com/digitalinfotainment and follow us on Facebook and Twitter.